Learn more and get tools to help LGBT youth in need. We have all been teased for being different. It never feels good to be a victim. So why would you let someone else suffer for being considered “different?” That is part of the reason that the Day of Silence was created, to help stop LGBT bullying amongst youth in and outside of school. The Day of Silence (which, in 2016, falls on April 15th) is meant to bring awareness to the continued abuse that LGBT students suffer, such as anti-LGBT name-calling, bullying, and harassment, which prevents them from receiving an effective education and from feeling secure in public. According to the 2013 National School Climate Survey, 9 out of 10 LGBT students reported verbal, sexual or physical harassment at school, and 30% of them reported missing at least, one day of school in the past month for fear for their personal safety. The Day of Silence was started by students on the campus of the University of Virginia in 1996 as a class assignment to study non-violent protests. Since then, the Day of Silence has been observed by students in all 50 states, with 10,000 students registered every year. GLSEN (Gay, Lesbian and Straight Education Network), became a sponsoring organization in 2001. For youth, you have the ability to make change happen. If there are students in your school that mistreat LGBT students, you can help increase the level of safety for those in need and teach your fellow students about tolerance and respect. Here are some of the tools and tactics you and your friends can use to stay safe and promote the Day of Silence in your school. Know your rights. If you are a LGBT student or know someone who is, there is protection in the form of laws and rights. The ACLU (American Civil Liberties Union) has created an online resource that contains the rights and laws youth have against harassment and bullying. You can help stop LGBT bullying by arming yourself with knowledge. Become a leader. The Gay-Straight Alliance (GSA Network) empowers and trains LGBTQ and allied youth leaders to advocate, organize and mobilize an intersectional movement for safer schools. One of the resources they provide is a leadership training program that give youth the necessary skills to form GSAs in their schools and communities. Conferences, training summits, and a 3-day activist camp give youth the core skills needed to help stop LGBT bullying, and combat homophobia, transphobia, and oppression. Get organized. Advocates for Youth (AFY) is a nonprofit organization that partners with youth leaders, adult allies, and youth-serving organizations to advocate for policies and champion programs that recognize young people’s rights to honest sexual health information; accessible, confidential, and affordable sexual health services; and the resources and opportunities necessary to create sexual health equity for all youth. As a way to realize their mission, AFY developed a Youth Activist’s Toolkit, which provides the information and resources necessary for a youth to become a community organizer, create a social justice campaign and manage its progress. For youth who are interested in opposing anti-LGBT bullying and harassment, the toolkit provides a step-by-step process to creating a social justice campaign. Hold an event. PACER’S National Bullying Prevention Center, founded in 2006, actively leads social change, so that bullying is no longer considered an accepted childhood rite of passage. The organization provides resources for students, parents, and educators to inspire, educate and get others involved. One of those resources is the “You’re Not Alone” Event Toolkit. This resource gives you the instructions on how to create and host an event, as well as posters and buttons that can be downloaded and shared with attendees. The toolkit is available for purchase, and has enough materials for up to 50 attendees. Join NRS’ Youth Activist League (YAL). NRS’ mission is to keep runaway, homeless and at-risk youth safe and off the street, but one of the big challenges we have is actually connecting with other youth who may not be aware of our services. In response, we created the Youth Activist League, which helps carry our message through each member’s personal network. Our YAL members are able to gain community service hours for their work, as well as get a better understanding of social justice as a career. One of the issues that we help our YAL to deliver is anti-bullying prevention and stop LGBT bullying, as well as LGBTQ discrimination. By joining our YAL, you are helping in our mission to protect those that need the most protection. 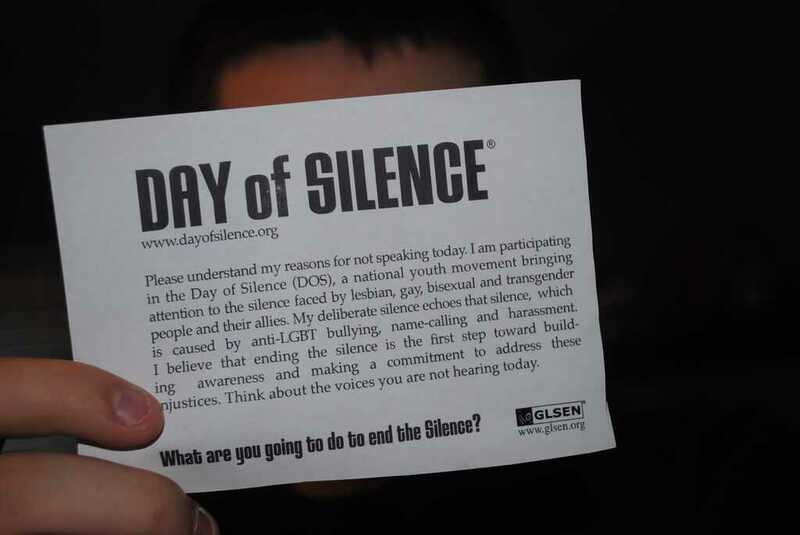 So there are several ways you can observe the Day of Silence and help stop LGBT bullying. Consider one or all of these options with your friends, and see what you would like to accomplish. Any kind of work like this will have an effect on your community for the betterment of everyone. If you have any other questions, feel free to contact us through our website, 1800RUNAWAY.org.